A girl coming-of-age faces danger, death and new life in 1940s Appalachia. A novel by Susan Gabriel. Named to Kirkus Reviews Best Books of 2012! 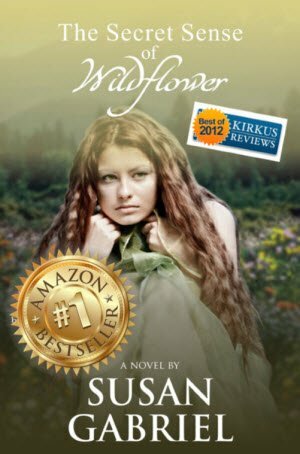 Click “Buy Now” below to get your autographed copy and start enjoying The Secret Sense of Wildflower. Includes a personal “thank you” from the author and a personal dedication if desired. The Secret Sense of Wildflower, autographed edition. List price $11.99, Only $9.99 plus shipping. Do you prefer an Audiobook? Listen to this audiobook FOR FREE with a 30 day free trial on Audible. You can listen to a sample here. Also on Amazon or iTunes. In this novel, life turns toward a dark horizon for a precocious adolescent grieving for her father in 1941 Tennessee. It’s difficult to harbor secrets in a rural mountain town of maybe 80 souls, especially when adult siblings live within spitting distance of the family home. Most of the townsmen work at the sawmill, and most of the young women have been harassed at one time or another by creepy Johnny Monroe. But Louisa May McAllister, nicknamed Wildflower, knows that revealing her frequent forays to the cemetery, where she talks to her beloved late father, would only rile her embittered mother. She also knows to hide her “secret sense,” as it would evoke scorn from all save eccentric Aunt Sadie, who shares her tomboy niece’s gift. “Those secrets come at a cost when, on one of her graveyard visits, Louisa May ignores her premonition of danger. The consequences somewhat expected yet still horrific are buffered by the visions into which the 13-year-old escapes. Sharp-witted, strong, curious and distrustful of authority figures not living up to her standards — including God — Louisa May immerses us in her world with astute observations and wonderfully turned phrases, with nary a cliche to be found. She could be an adolescent Scout Finch, had Scout’s father died unexpectedly and her life taken a bad turn. The worlds of family, friendship, mourning, and love are explored in this moving, often humorous, novel about healing and hope. A character-driven novel reminiscent of the work of Reynolds Price in its ability to create a truly original Southern voice, The Secret Sense of Wildflower is certain to be embraced by fans of Sue Monk Kidd (The Secret Life of Bees) and Harper Lee (To Kill A Mockingbird). “This story will move you as it twists and turns and eventually connects the dots left behind whilst developing into a work more than worth the read. Yes, it’s THAT good! I found the story completely enveloping. You laughed when the characters laughed, grieved when they grieved and sought happier places when the ugliness of the world presented itself front and center. In some ways it reminded me of the infamous To Kill A Mockingbird; perhaps because of the young narrator and the strong voice with which she was blessed, perhaps because of the time and setting used, or perhaps simply because it was that striking of a work. Whatever the reason, it left its mark on me and for that I can only extend my thanks to the author with sincerity from the bottom of my heart. A masterpiece; plain, simple, and resilient like the flowers the young lead is named for. Check out all of Susan’s books here. Find out about Susan’s newest book here. Be the first to know about my newest books! I email about 2-3 times a year.